We are giving our Facebook fans a chance to win "Cream color textured leather Tornado with chrome accents " ! Show us your ugly pen and win! a. Like our Page to become a fan! 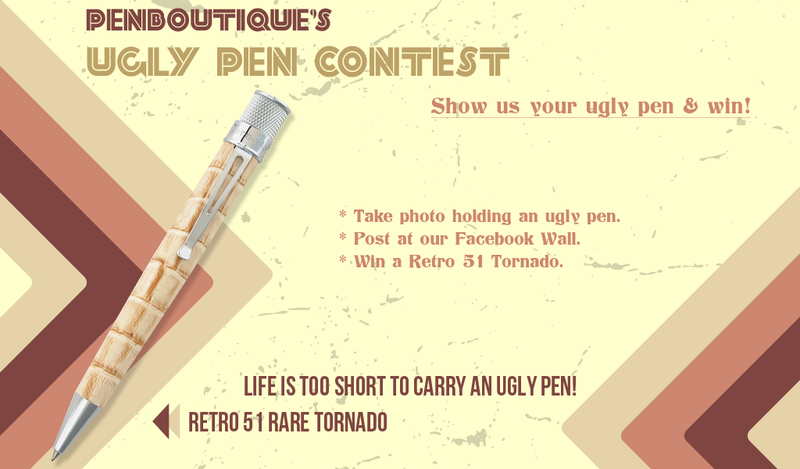 c. Bring maximum votes on your Photo with "Likes"
We are hosting this "Ugly Pen Contest" for our awesome Pen Boutique fans. The winner of this contest will be announced on our Timeline and Pen Boutique blog ( blog.penboutique.com) during the last week of April. * Photos of Ugly Pens—Fountain pens/Rollballs/Ballpoints, Recent or Old, must be original. *No Computer Generated Photos Will be Accepted. *Photos with Copyright or the Images from Internet will not be accepted. *If somebody claims the Copy Right for Uploaded image your participation will be considered as invalid. Free shipping to Winners within USA.International participant shipping will be additional and you can also add it free to your any pending orders. All the citizens from USA with valid Facebook ID are encouraged to participate.International customers are welcome to participate but shipping will be additional and you can also add it free to your any pending orders. Winners will be selected based on total likes gain by the Contestant Photo. Get your friends to like your photo(s). Please make note that the winner is primarily based on Ranking by the Page Owner or the Contest Moderator. The number of Likes on photo will improve your chances to be Ranked. All images submitted must be the work of the individual submitting them. This promotion is in no way sponsored, endorsed or administered by, or associated with, Facebook. 1.) This giveaway/contest is void where prohibited by law. The contestants assume the total responsibility of knowing their local laws in regard to "Ugly Pen" Contest ! and are subject to any local, state, national or international laws. Friendship Circle accepts no responsibility for making these individual legal determinations. 2.) Winner are solely responsible for any taxes on their respective prizes. 3.) No substitution of prize is offered. 5.) Prizes should be claimed within 30 days of the announcement of winner. Any claims made after 30 days will be considered void. Pen Boutique, Limited, USA, is not responsible for any such claims after that time. 6.) If a prize, or any portion thereof, cannot be awarded for any reason, Pen Boutique, Limited, USA, reserves the right to substitute a prize with another prize of equal or greater value. That determination will be made by Pen Boutique, Limited, USA. 7.) Winners must verify their email and shipping address when contacted via email address on file.